My inaugural column in these pages, eight years ago, explored the world of crowdsourced answer Web sites. 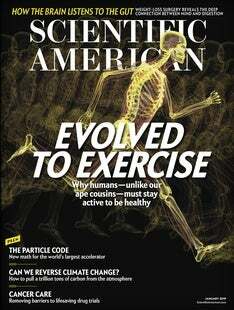 My last Scientific American column—well, you're reading it. My tenure here has aligned neatly with the rise of everything in the headlines today: smartphones, apps, social media, self-driving cars, AI, augmented reality, voice assistants, data breaches. So I thought I'd leave you with six lessons about technology. These are hard-won bits of wisdom, gleaned from decades of observing two fascinating populations: tech companies and the rest of us. Just because they make it doesn't mean you need it. The big tech companies chase after new ideas like first-grade soccer players chasing the ball en masse. They're running that way not because it's strategic but because everyone else is running that way. Oh, the billions of dollars blown on Amazon's DOA smartphone, Google's discontinued Glass wearables or Apple's failed social-media networks! Oh, the sadness of those early adopters who bought those pre-iPad tablets, Microsoft's smartwatches or Internet refrigerators! Maybe we can forgive them. Not everyone can be Steve Jobs, capable of knowing what the masses want before they do themselves. Without that insight, all the companies can do is imitate their competitors so they won't be left out. If you're baffled by the appeal of some heavily hyped tech invention, there's nothing wrong with you. It's the inventor's problem, not yours. Frictionless always wins. If you want to place bets on the success of new technologies, examine how much “friction” they eliminate: effort, steps and hassle. The remote control; microwave meals; e-mail; text messages; the iPod; Google Maps; Amazon.com; Siri and Alexa; and, yeah, self-driving cars—each, in its way, introduced a new way to let us be lazier. Innovation in a category slows down. When a new product category appears, it's a bare-bones invention. The first iPhone, for example, had no front camera, no flash, no copy/paste, no voice recognition, no video recording. The first few years of a new invention, therefore, are filled with breakthroughs as the manufacturers fill in the holes. Eventually, though, every product reaches its ultimate incarnation. Some have been there for years; when's the last time you felt the need to replace your dryer, flashlight or microwave because it doesn't have the latest features? Already it's becoming harder and harder for Apple, Google, Microsoft and Samsung to dream up new must-have features for their phones, tablets and laptops. Too bad for them—but good for you. You can keep your existing gadget that much longer. Utopia never arrives. So much tech promises to make the world a better place. Social media will make us a harmonious global family! Self-driving cars will save lives! The Internet will give everyone a voice, democratizing the whole world! Alas, the law of unintended consequences means all those utopias never seem to arrive. Social media has turned into a breeding ground for hate-mongers. Self-driving cars may destroy insurance companies and ride-sharing outfits. And the Internet is becoming more cesspool than community pool. Doomsday never arrives, either. On the other hand, we tend to overpredict the negative effects of new technologies, too. Every generation has its “that's gonna rot your brain” technology. My grandparents were told to quit sitting so long in front of that infernal radio. For me, it was the television. For our kids, it's the smartphone. These technologies certainly change us, but that doesn't mean they actually make us worse—and they've never actually brought the end of the world. Somehow we muddle through. Thanks for reading and for thinking. See you on Twitter, the Web, TV—or whatever the industry decides we need next.